Recording of sound is an old dream of man. Scientists began to declare the physical basics of sound in the early Middle Ages already. Bonetius, roman philosopher described the relation between fastness of vibration and the pitch of the sound at the end of the 5th century . In the Middle Ages, many researchers tried to record sounds but they were not too successful, due to the insufficient knowledge. Giovanni Battista della Porta, a great natural scientist, who lived in the 16th century, wanted to "trap" the sound with metal tubes. He thought, if he speaks into the tube and covers that very fast, then the sound will be caught and he can listen that later. He was very enthusiastic, but he could not reach any result . First, Jean Duhamel, French physician and mathematician proposed a good plan of a sound recorder and player machine. He thought that the vibrations of air could be recorded by an elastic membrane connected with a needle that scratches a soft material . The first machine that worked properly, was created by Thomas Alva Edison in December, 1877. As Duhamel suggested, Edison recorded the sound to a tinfoil-covered cylinder by a needle, a membrane and a sound-collector funnel (figure 1.). The cylinder rotated on a screw-thread and the sound was recorded on a spiral-line , . 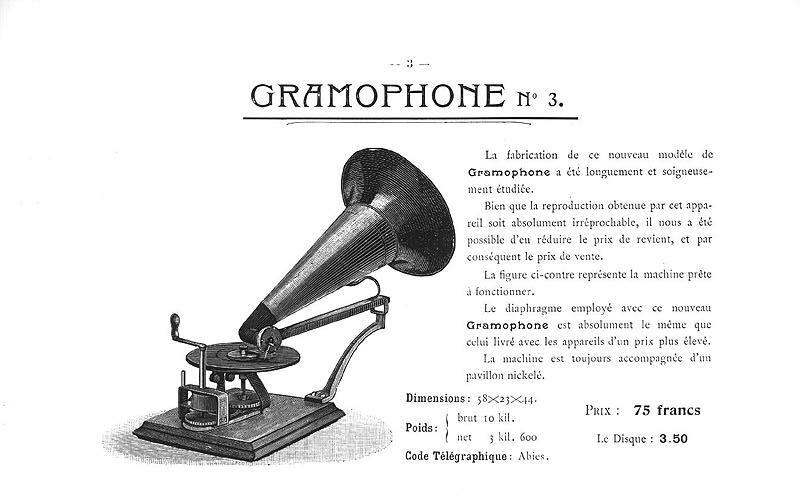 After 10 years, in 26 September, 1887, Emil Berliner got patent to a new sound recorder device, named gramophone . The gramophone device records the sound on a disc and not on a cylinder (figure 2.). The disc shaped sound carriers - the records - take less space than a phonograph cylinder and discs can be easily copied by a printing-sample. With printing-sample, hundreds of copies can be made from one record in contrast with the phonograph, where every phonograph-cylinder was produced by a new sound-recording. The gramophone became very popular due to the advantage of easily made copies and slowly squeezed out the phonograph from the market. First, records were produced by acoustic way. The sound-grooves in the record were produced by the mechanical vibration of a needle connected with a membrane made of high quality leather, which was vibrated by the air. A big funnel amplified the vibrations of air (this device matched the impedance of air with the impedance of membrane). An acoustic sound-recording can be seen in figure 3. One record contained 3 or 4 minutes of sound-recording. First, the sound was made only on one side of the record, the double-sided gramophone records were put into circulation only in 1904. The velocity of records was 78 rotate per minute but they were manually rotated, therefore the real velocity strongly fluctuated. Later, the sound-recorder gramophones were rotated by electric motors. In that time the velocity was standardized in 78.26 rpm (this is the 46th part of 3600 rpm, which is the velocity of motors in America on the 60Hz electric network). Figure 1. Phonograph from the 19th century. Figure 2. Manually rotated gramophone. Figure 3. Acoustic sound recording. Berliner and his employees cut the sound grooves into zinc-discs then they made a positive printing-sample from the grooves by galvanoplastic way. The copies were made with this printing-sample. Later, they made steel printing samples and they printed the copy to ebonite discs . After a long research, Berliner found a good printable material, called shellac. It is a cleaned resinous secretion of a tropical aphid species. It was enough soft for printing and it was cheap, too. This material was the popular basic material of gramophone-records, until plastics were put into circulation. The shellac was not too good for cutting therefore wax-records were used for sound-recording. In 1920 the Bell laboratories began to make scientific research in the gramophone subject. They exactly cleared the physical and mathematical relations of sound-recording and in 1924 they created the first electromechanical sound-recording devices. The recordings were produced with microphone, electrical amplifier and cutting-head. These recordings contain less noise, have higher dynamics and less distortion. The Bell laboratories created an electrical record-player, but it was too expensive and was not so popular. The Bell laboratories made the first stereophonic sound-recordings in 1931 . In September 1931, the RCA Victor company unveiled the long-play record with 33 1/3 rpm. They used a new sound carrier for the good sound quality. It was acetylcellulose-polivinylchloride. They used thinner sound grooves, too. The playtime was 20 minutes (in contrast with the normal 4 minute playtime), the sound was better and the needle-noise was softer. First, the long-play record was not too popular. The RCA Victor did not want to use these records, because nobody was interested in them. In this time another sound-recorder and player device - the tape - began to spread, which was invented by Poulsen in 1905. However RCA Victor made a new, smaller record type with 45 rpm and only 5 minutes play time. It was good for dance-music. The 33 1/3 rpm records were put into circulation only in 1948 by the CBS. The first stereophonic records were put into circulation only in 1958 .